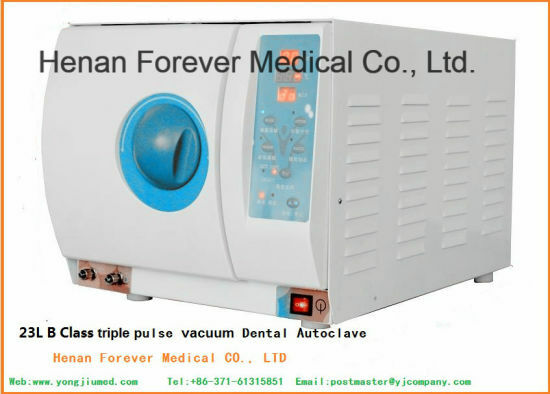 Autoclave, Dental Autoclave, 23L Dental Autoclave manufacturer / supplier in China, offering 23L Medical Used Electric Portable Autoclave Sterilizer, ICU Medical Equipment Multifunctional Anesthesia Machine, Medical Inatrument Orthodontic Products Portable Dental Xray Equipment and so on. 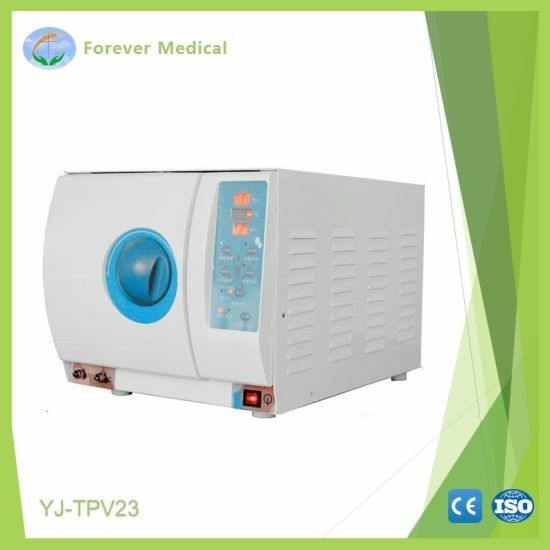 YJ series TPV vacuum autoclave is B grade(EN13060) small-size sterilization device,with vacuum pump inside.Using high temperature and pressure for the sterilization of multi-aperture instruments and apparatus.It is mainly intended for dental, operating room,ophthalmology,gynaecology instruments,etc. 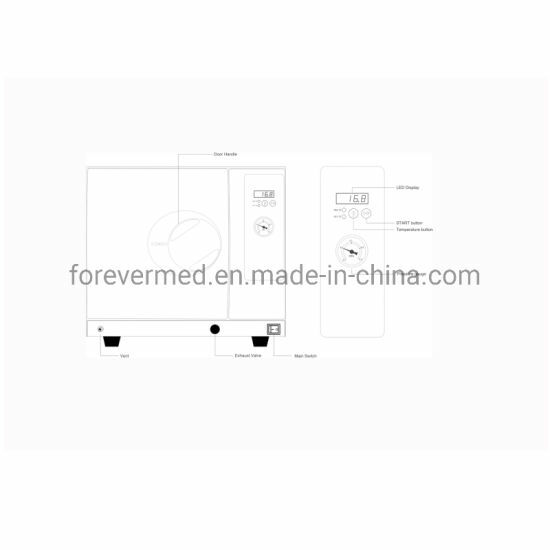 Sterilized Target: YJ series sterilizer is our company specially design&manufacture for hospital surgery, lab, dental clinic, inspection room and such those place where need sterilization continually. Mainly Structure:It's mainly consist of sterilization room, water storage tank, steam generator, vacuum pump, pressure sensor, temperature sensor, condenser, cooling water collector,condensation tube. Wire plug: nation standard three core or Europe standard three core. Standard Sets The integral bracket,the apparatus bracket,the handing rack,the exhaust and drainage pipe,The standby rubber ring. Strong vacuum drying, it's suitable for different materials drying requirements; The equipment residual humidity <0.2%. Steam discharging Inlay condensed water collector, the waste steam will exclude after condensation by the condenser rather than exhaust the exhaust steam outward, more safety and cleanliness. Impulse method: Microcomputer controls the frequency of pulsation according to the site condition and ensures the coordination of temperature and pressure. Applicable to all types of packaging, no packaging, solid, A hollow, B hollow and category B hollow porous and internal pipeline equipment sterilization; ensure efficient removal of air in the interior of a hollow instruments (such as high-speed dental drill), make the high temperature steam can fully reach every corner. Vacuum method: Triple pre-vacuum to ensure that the temperature is more rapid and the sterilization more thorough. Micro-computer control technology The sterilizer using microprocessor intelligent control, man-machine interface, easy to operation, safe and reliable. Each parameters and the status during the operation will dynamic display through the digital screen . Vacuum, water injection, heating, sterilization, decompression, exhaust, drying and power-of will finished completely automatic. Automatic detection and alarm if equipment abnormal. automatic fault diagnosis. 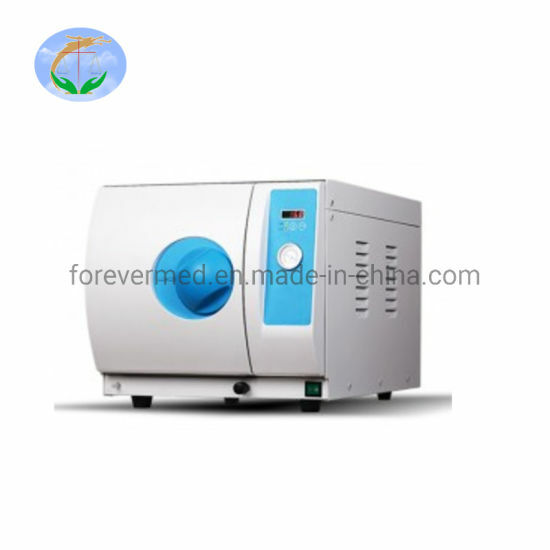 Over temperature, overpressure automatic protection, to ensure the reliability of sterilization. Sealing structure Sealing ring for silicone products, the design of service life is 2 years (1200 times), not aging and deformation. cleaning Can clean inner pipe and steam generator automatically. Vacuum pump Adapting a double headed vacuum pump, simple and convenient, fast vacuum speed, long service life. To ensure that the vacuum degree can reach -80kpa. Pressure sensor: Inlay pressure sensor to test chamber pressure automatically, to ensure that the precise and efficient of chamber pressure. Temperature sensor: Inlay temperature sensor to test chamber temperature automatically, to ensure that in the precise range of using temperature ±3ºC of chamber.